In Kotlin, to check if the file already exists, use File.exists(), exists() returns a Boolean value. It returns true if the file exists and false if the file does not exist. val filename = "chercher tech.txt"
We will learn about how to use these file writing methods in kotlin. File.createNewFile() creates a new file, if it does not exist already and returns Boolean value of true. If the file exist at the path provided, then createNewFile() functions returns false. The file created is empty and has zero bytes written to it. createNewFile() is the way in which exiting file will not overridden. Remaining ways will overwrite the file if it exists. In below example, we will try to create new file and then we try to override it. writeText() function creates a new file if it does not exist already and writes the text (string argument) to the file. If an empty string is provided, the file is created and nothing is written to it. if file exists in the path already then file will be overridden, Sets the content of this file as text encoded using UTF-8 or charset specified by the user. writeBytes() function creates a new file and writes array of bytes provided to the file created. If this file already exists, it becomes overwritten. 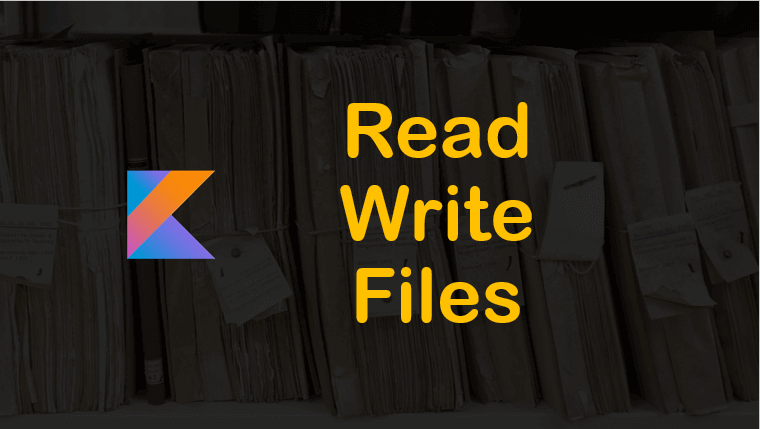 We can read contents of a file in Kotlin either by using standard methods of java.io.File class, or the methods that Kotlin provides as an extension to java.io.File. inputStream() Constructs a new FileInputStream of this file and returns it as a result. readBytes() Gets the entire content of this file as a byte array. This method is not recommended on huge files. It has an internal limitation of 2 GB byte array size. readLines() Reads the file content as a list of lines. Do not use this function for huge files. Creating a file is different from writing a file, we can write content to file while creating it but sometime we may want to write to a file which is already present in the file system. var content:String = "dummy text to show writing to file in koltin chercher tech"
What is the difference between simply writing to a file vs appending data to a file? In the case of writing to a file, a program can start writing from the start but in the case of appending text, you start writing from the end of the file. You can append text into an existing file in Kotlin by opening a file using appendText() function in File class. var content:String = "dummy text to show writing to file in kotlin chercher tech"